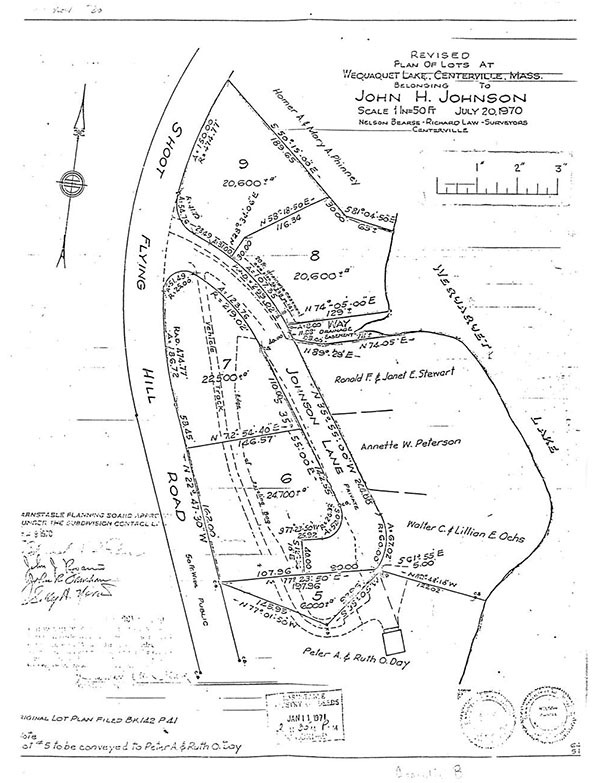 The plaintiffs herein seek a declaratory judgment to determine whether or not they have by grant or implication a right of way for passing and repassing over a parcel of land shown as "Way-Drainage Area for Road" ("Way") between Johnson Lane and Wequaquet Lake in Centerville, Barnstable County, on a plan entitled "Plan of Lots at Wequaquet Lake, Centerville, Massachusetts belonging to John H. Johnson, August 30, 1957" recorded June 5, 1958 in the Barnstable County Registry of Deeds, Book 142, Page 41 [Note 1] (Exhibit 3) (the "1957 Plan"). [Note 2] In addition, the plaintiffs seek an order from the Court that the defendants remove any obstructions which deny the plaintiffs the beneficial enjoyment of said Way. A trial was held on June 3, l987 and a stenographer was sworn to record and transcribe the testimony. Four witnesses testified and fourteen exhibits were introduced into evidence, which exhibits are incorporated herein for the purpose of any appeal. 1. The land presently owned by the plaintiffs and that of the defendants is part of a larger tract which was originally owned by John H. Johnson ("Johnson"), who divided it into lots of approximately one-half acre as shown on the 1957 Plan. 2. In 1965, Johnson conveyed Lot No. 4 as shown on said plan to Walter and Lillian Ochs. The lot is located between Johnson Lane (a private way) and Lake Wequaquet. 3. 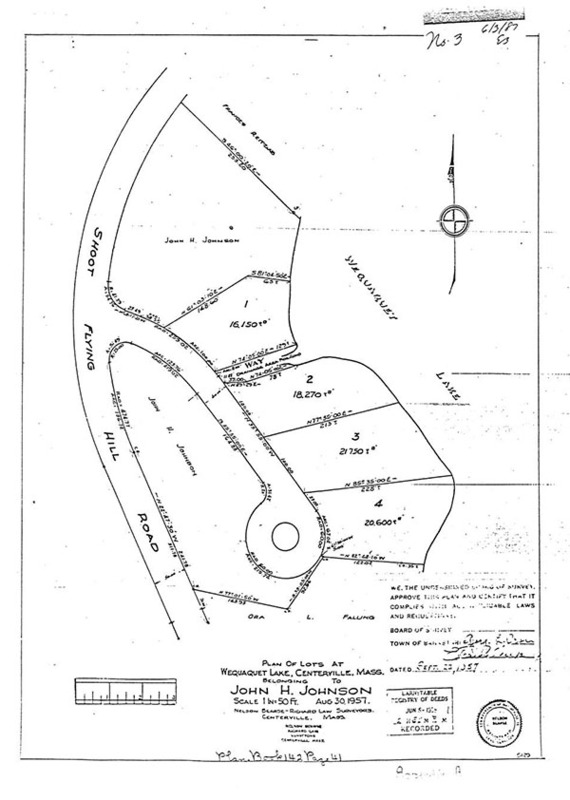 In 1970, Johnson deeded a drainage easement to the Town of Barnstable to be utilized for drainage as shown on the "Town of Barnstable Plan of Proposed 20 ft. Drainage Easement, May 5, 1970" (Exhibit 12). This easement runs along Johnson Lane and across the Way to Lake Wequaquet. 4. In 1971, Walter and Lillian Ochs acquired a second lot from Johnson by deed recorded in Book 1532, Page 103. This lot is shown as Lot No. 6 on a revised plan entitled "Revised Plan of Lots at Wequaquet Lake, Centerville, Massachusetts, belonging to John H. Johnson, July 20, 1970" recorded January 11, 1971 in Book 243, Page 37 (Exhibit 1) (the "1970 Plan"). This plan depicts Johnson Lane, a private way leading out of the subdivision to Shoot Flying Hill Road. On both Exhibits 1 and 3, the Way is shown running off Johnson Lane, although there is no opening in the boundary line of Johnson Lane; and is designated "Way-Drainage Easement" on the 1970 Plan and "Way-Drainage Area for Road" on the 1957 Plan. The deed to Lot No. 6 gives the grantees an express right to use Johnson Lane with others entitled thereto (Exhibit 2) but makes no mention of the Way. 5. In 1973, Johnson deeded the defendants the Way subject to a drainage easement and to the rights of record in all persons lawfully entitled thereto (Exhibit 9). 6. Since some time prior to 1965 when the grantees acquired Lot No 4, a pumphouse has existed on the premises. This structure originally housed the machinery used to pump water to a cranberry bog located on the Johnson land prior to the subdivision. 7. Since 1970, the Town of Barnstable has maintained the drainage lines and discharge pipes from Johnson Lane across the Way to Lake Wequaquet. There is no evidence to demonstrate that the Way was ever intended to be anything but a drainage area. The issue before this Court involves a determination of the plaintiffs' rights over the Way leading from Johnson Lane to Lake Wequaquet. The mere reference in a deed to a lot number and a bounding street, as shown on a recorded plan, does not as matter of law give the grantee an easement in all the ways shown thereon, nor prevent the grantor from making changes therein not inconsistent with the rights of the grantee. Each case is to be decided by ascertaining the intent as evidenced by the deed and circumstances in which it was made. In determining the intent, the entire situation at the time the deeds were given must be considered. For example, whether the ways in question merely existed on paper, or were then constructed on the ground; whether they were then actually used as appurtenant to the granted premises; or whether they were remote or in close proximity; Walter Kassuba Realty Corp. v. Akeson, 359 Mass. 725 -727 (1971) citing Wellwood v. Havrah Mishna Anshi Sphard Cemetery Corp., 254 Mass. 350 , 354 (1926) and Prentiss v. Gloucester, 236 Mass. 36 , 52-53 (1920). Applying these principles to the present situation, it becomes relevant that the Way involved has never been used as a means of access to Lake Wequaquet for any parcel in the subdivision nor for any purpose other than draining or pumping water. The plaintiffs allege that the pumphouse must be removed if they are to exercise their rights in the Way. The defendants, since purchasing the Way in 1973, have erected a fence, planted shrubbery and maintained the structure. The plaintiffs also seek the determination of an easement by implication over the Way.
. . . implied easements whether by grant or by reservation, do not arise out of necessity alone. Their origin must be found in a presumed intention of the parties to be gathered from the language of the instruments when read in the light of the circumstances attending their execution, the physical condition of the premises and the knowledge which the parties had or with which they are chargeable. Dale v. Bedal, 305 Mass. 102 , 103 (1940). The plaintiffs have the burden of proving that an easement by implication exists over the defendants' Way. Wellwood v. Havrah Mishna Anshi Sphard Cemetery, supra at 355. Walter Ochs testified that he purchased Lot No. 6 in order to protect his privacy in Lot No. 4 by insuring that no one would build directly across Johnson Lane. Since 1971 when he purchased Lot No. 6, Walter Ochs has not used this lot for any purpose other than the protection of Lot No. 4. He has never accessed Lake Wequaquet via the Way. In addition, while there may have been some discussion concerning the existence of the Way at the closing for Lot No. 6, there is no competent evidence that an easement in the Way was a factor in the conveyance nor that it was the intent of either the grantor or grantee that the rights in the Way be included in the conveyance. Based on the above, I find and rule that the plaintiffs have not met the burden of showing an easement by grant or by implication exists over the Way such as to allow the plaintiffs access to Lake Wequaquet. Accordingly, it is unnecessary to discuss the removal of any impediments existing on the Way. [Note 1] All references herein are to the Barnstable County Registry of Deeds. [Note 2] The 1957 Plan is attached hereto as Appendix A and the 1970 Plan herein referenced is attached hereto as Appendix B.